Evolution, at least in marine organisms, tends to favour the emergence of bigger animals according to new research published by Stanford University of California. A trend for “bigness” – a term coined by a Year 3 pupil we overheard the other day during a dinosaur workshop we were conducting at a school, seems to have been present in the oceans of the world, at least since the Cambrian, a time when the first hard-bodied creatures evolved. This suggests that the path followed by natural selection can be predicted, it indicates that evolution may follow certain rules, at least for one important biological trait – body mass. 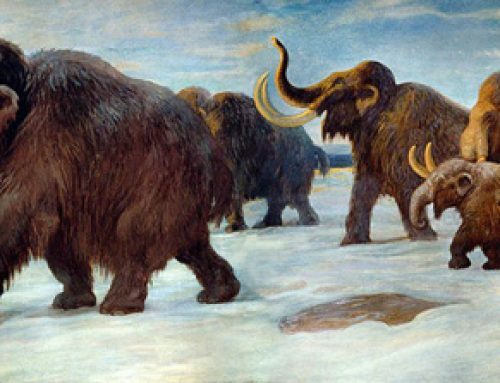 It was the American naturalist and palaeontologist Edward Drinker Cope (1840-1897) who proposed a natural law, now referred to as “Cope’s Law” that the ancient ancestors of extant animals were usually much smaller than their modern counterparts. Building on the research from some of Cope’s rivals, such as the work on the evolution of equines (horses) by Othniel Marsh (1831-1899), Cope postulated that evolution had a tendency to produce larger animals. The first horses such as Propalaeotherium, known from the famous Messel shales near Frankfurt (Germany), were only sixty centimetres high at the shoulder. Dinosaurs too, seem to follow this rule, with the very first members of the Dinosauria being just a fraction the size of later types of dinosaur such as the enormous Sauropods Diplodocus, Barosaurus and Apatosaurus from the Late Jurassic. Dinosaurs tended to get bigger over time. This pattern is not consistent across the Kingdom Animalia. For example, Aves (birds) do not show this trend, very probably as there is a need to reduce weight in order to become more efficient fliers. Insects too, do not follow this trend, although in the case of the Insecta there are body mass limits probably related to atmospheric oxygen concentrations and the constraints of having an exoskeleton. However, in one of the most comprehensive research programmes ever undertaken, scientists from the Stanford School of Earth, Energy and Environmental Sciences conducted a review of over 17,000 extinct and extant marine genera. The study incorporates data from over sixty percent of all the animal types that have ever existed. The amount of work that had to be done was simply colossal. Members of the Department enlisted the help of University colleagues, undergraduates and even high school interns to search through the scientific record for measurement data on marine life forms from the Cambrian geological period to today. The study published this week in the journal “Science” concludes that over the last 542 million years the mean size of marine animals has increased by 150 fold. The Stanford research team also discovered that the increase in body size that has occurred since animals first appeared in the fossil record is not due to all animal lineages steadily growing bigger, but rather to the diversification of groups of organisms that were already larger than other groups early in the history of animal evolution. Over time there has been a tendency for marine animals to get bigger.. 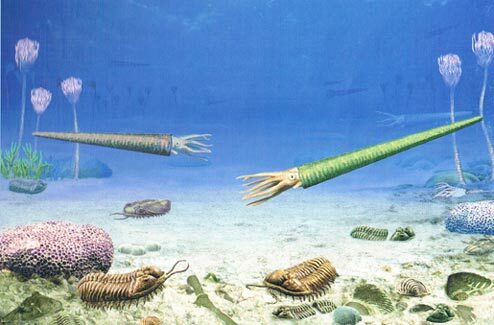 The picture above depicts a typical scene in a shallow Silurian sea about 428 million years ago (Wenlock Epoch). Analysis of the fossil record indicates that the explosion of different life forms in the Palaeozoic eventually skewed decisively towards larger, bulkier animals. Measured by volume, today’s smallest marine animals (microscopic crustaceans) are less than ten times smaller than their Cambrian counterparts. However, at the other end of the scale, perhaps the largest animal known from the Cambrian is Anomalocaris canadensis, which at nearly a metre in length, was huge compared to the other Cambrian fauna it preyed upon, but Anomalocaris at perhaps two to three kilogrammes in weight (estimate), was many thousands of times lighter than today’s largest sea creature the Blue Whale (Balaenoptera musculus). Body weights of Blue Whales have been calculated at over 190,000 kilogrammes. The research team also set about trying to work out whether the favouring of bigger sea creatures over time was really driven by evolutionary advantage, or was this trend just a case of serendipity? Neutral drift is the term used to describe changes in an organism that seem to infer no evolutionary advantage or disadvantage. A computer model was created and size data from the oldest animals included in the study was incorporated into it. From this data set a series of simulations were run to see how life in marine environments might have evolved. Each species used in this part of the research, could either die out, stay unchanged or get bigger or reduce in size. In the various scenarios that were tested, the version that best matched the fossil evidence was one where there was a genuine size advantage inferred. As for what those benefits of being big might be, the research team cannot be certain, but larger species may have been able to take greater advantage of resources by being able to swim faster, burrow deeper or to eat larger and more varied types of prey. Dr. Heim also suggested that the increase in oxygen may also have played a significant role in the evolution of larger animals.